Will Bouteflika Live to See Completion of Algiers Great Mosque? Algeria’s 81-year old ailing president has made a rare public appearance on a wheelchair looking wearier unable to speak or move at a time his advocates start an early campaign to prepare the public opinion for his fifth term. Bouteflika who visited the construction site of Algiers Great Mosque prayed on his wheelchair in a television footage. The project, which he launched, is running behind schedule with estimates of construction firms that the project will be ready in 2020 at best. The giant mosque that is being built to stand as a hallmark of Bouteflika’s legacy has come to represent all that is wrong with financial governance in Algeria. The monument is becoming a symbol of misallocated funds at a time Algeria adopts austerity measures to curb the impact of the slump in oil prices, the country’s main source of revenue. Besides financial challenges, a set of technical issues are also casting doubt on the resilience of the Algerian mosque’s minaret to earthquakes. These concerns are fed by Algeria’s location sitting astride two major plates regularly hit by earthquakes, especially along the Mediterranean coast. 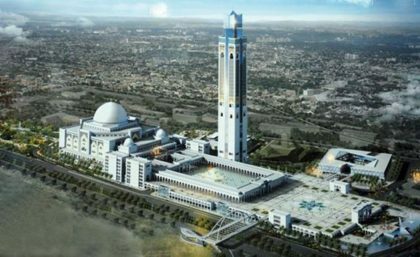 The fund-consuming mosque raises the issue of graft in Algeria’s infrastructure projects. Algeria’s East-West highway project worth $13 billion is one of the most expensive in the world due to several graft scandals involving local officials and foreign firms. The highway mushroomed into a major scandal as it ran into repeated delays because of corruption investigations. In another graft scandal involving foreign suppliers, a group of former top officials from the Algerian state oil company Sonatrach were indicted on corruption charges.